Every consultant has at least one project horror story, though some of us have seen more than others. You may call it the project from hell, the death march, or the one that ended up in the ditch. If you haven’t experienced a project that’s gone sideways, consider yourself in the lucky minority. When a project runs aground, it’s almost always avoidable—at least in hindsight. Projects that end up sideways usually kick-off with unbridled enthusiasm; consultants and clients expect sky-high results. That euphoria often sows the seeds of future trouble. In one case, a giddy project team was confident that the project approach would literally transform the company. But the team was stymied every step of the way, and they squandered almost $6 million before the client’s executive committee closed the project down. In the planning phases of that $6 million debacle, the project team had worked through the plan to make sure the project tasks could be completed. Sadly, the team failed to focus on the possible minefields ahead. Here’s a tool to help you keep project setbacks to a minimum. Use the simple 2×2 matrix below to sort out potential problems and create a strategy for handling most anything that gets thrown at your team. Begin by making a list of every conceivable predicament that could crop up, no matter how impossible it seems. Once you have your doomsday list, use the matrix to categorize each predicament in two ways. First, assess how the event might impact the project. A low impact event may slow the schedule slightly, while a high impact one could mean project cancellation. Then, forecast the probability of each event occurring. The categorization process is more art than science, but it helps you focus on anticipating risks, rather than waiting to be blind-sided. Usually, project teams resist this kind of thinking; they prefer not to focus on the negative aspects of a project, especially during the euphoric outset. Like it or not, the beginning is the best time to get the potential pitfalls out in the open. These surprises can be handled by reacting to events as they unfold, rather than creating an elaborate strategy in advance. For example, a project team discovered that its assigned room had poor cell phone reception. That had a slight impact on the project—until the team was outfitted with pagers, which had good reception. It was a nuisance that didn’t seriously impact the team, and it was resolved immediately. There will be snags on every project, and the team can usually react as needed. These events may slow the project only slightly, but given their high probability, plan your reaction to roadblocks in advance. In one instance, poor weather prevented the clients and the consultants from traveling to crucial meetings, causing decision-making delays. Because the project was occurring during a Midwest winter, the project managers wisely planned for project slippage specifically due to bad weather. The impact of high probability events should be explicitly considered as the project plan is crafted. 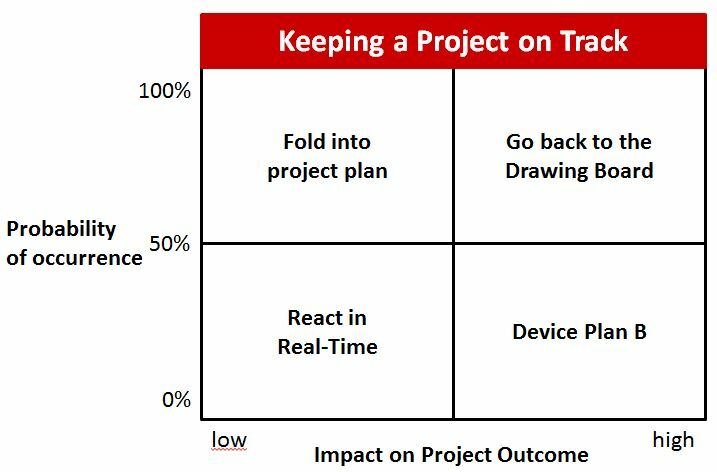 A high impact event can completely derail a project, so focus planning efforts here even if the event probability is low. For dilemmas in this category, you definitely need a Plan B. Take the case of the project manager who suddenly fell seriously ill. The project fell off schedule immediately. The team’s lack of a suitable replacement caused a long delay in the project and confusion among the team members. For high impact/low probability events, be sure to have fall-back options, like a sure-footed leader to step in if an emergency occurs. You want this quadrant of the matrix to be empty. If it isn’t, run for cover. In one case, a project team began work with only 50% of the required team members. The scope of the effort and the capacity of the team were completely misaligned. The result was a high probability—more like a certainty—that the project wouldn’t get done. Retooling the plan is the only way to avoid project disasters. Look back at your projects that worked well and those that didn’t; both will provide valuable clues about potential problems. Consider these ten common surprises that can put any project team on the ropes. Unknown stakeholders are people who have influence over a project’s direction, outcome, resources, or schedule without the project team’s knowledge at the outset of the planning process. Unexpected resistance goes beyond the normal objections to change that consultants routinely encounter. As you might guess, unknown stakeholders are often the source of unexpected resistance. External events can have a profound affect on any project. A client merger or acquisition, for example, can stop a project dead in its tracks. Chemistry is how well a project team works together. Poor chemistry on a team can contribute to highly negative behavior and can jeopardize project success. Late delivery of anything generally wreaks havoc with project schedules and creates unplanned time pressure on project activities. Fuzzy project scope results in a lack of a common understanding about what the project is intended to accomplish. Without agreement about where you and the client want to go, you probably won’t get there. Lack of early, demonstrable progress can create a perception that the project is floundering, even if it isn’t. Project teams shouldn’t keep their accomplishments a secret. Especially on large projects, plan to achieve a milestone every 100 days, at a minimum, and make sure everyone involved knows when it’s reached. Executive turnover can cause a change in project direction, or may even result in a project being cancelled. That has been known to happen even when the client stands to lose its investment in a project. Project team emergencies occur with regularity, especially during large or lengthy projects. Losing a team member for an extended period can change the dynamic and productivity of a team. Ineffective communication always leads to problems and will make project results unpredictable. Be sure communication travels in all directions and as far into the client’s organization as possible to help locate unknown stakeholders, identify areas of unexpected resistance, and prepare for the unexpected. Michael W. McLaughlin is the coauthor, with Jay Conrad Levinson, of Guerrilla Marketing for Consultants. Michael is a principal with Deloitte Consulting LLP, and the editor of Management Consulting News and The Guerrilla Consultant. Find out more at www.guerrillaconsulting.com and www.managementconsultingnews.com. The central premise of this book is that most projects and strategies never get off the ground because of adhoc, haphazard, and obsolete methods used to turn their ideas into coherent and actionable plans. This is the first book to couple a step-by-step process with an interactive thinking tool that takes a strategic approach to designing projects and action initiatives. This book will start at square one with the fundamentals, step-by-step itl takes you from the basics of creating a budget, schedule and scope to more advanced topics such as mitigating project risks and expectation management techniques.